Photojournalism, East Rutherford, NJ 12-1-2017, Montclair High School Football wins the State Championship. The final score 35-14 and the opponent, Union City, are all well documented. What is special is the unique bond between the team and their fans that was on full display Friday night under the lights at MetLife Stadium in East Rutherford, NJ, and is best told via the photos. Montclair High School football under the leadership of Head Coach John Fiore and senior Quarterback Terrin Earle, the team returned to this field for the fourth time in six years. Long before the Mounties took the field, their enduring fans started to assemble in the stands. The team and the fans are a set, they together won this year’s State Championship football title. This article is best illustrated by the body of photos capturing the spirit of the game, the fans, and the team. With limited space here, the balance of the accompanying photos can be seen online. 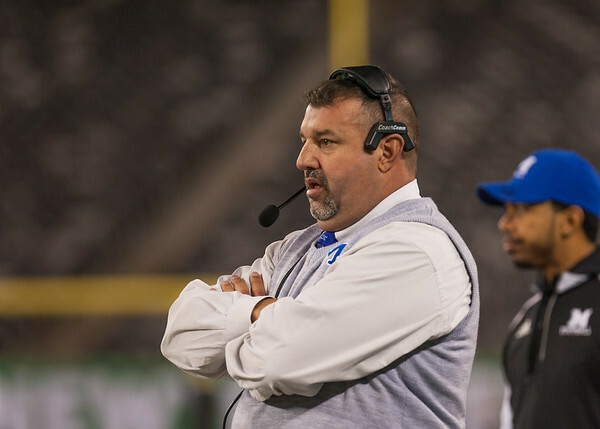 Head Coach John Fiore is certainly on a roll after his third perfect season with four state championship titles in six years, a record that has stood unmatched since the legendary Clary Anderson last did the same in 1966. Anderson brought home 16 state championships to Montclair from 1940 through 1968. Clary Anderson literally wrote the book on how to be a proper championship athlete in mind, body and soul. The relationship between the team, their fans, and community can be a powerful force for success. Weeks before the championship game the community and the student body began to make plans to attend Friday night’s game at MetLife Stadium. Local shops like Studio042, and online outlets like MontclairMounties.com, enjoyed a significant bump in sales leading up to the event. On the Montclair side, an estimated 1,500 student fans attended the game, packing the student sections beyond capacity. Add in the estimated 750 family members, teachers, and supportive community members and the Montclair fans in total outweighed the opponent’s fans 2:1. Well before the teams took the field, the Montclair students began to assemble in their familiar ‘Student’ section. Current students, alumni, significant others, and the young-at-heart packed themselves in together as tight as friends could be. At precisely 4:59 and 39 seconds, the Mounties stormed onto the field behind their giant team flag and flag bearer, senior, Danny Webb in jersey #1. On cue, a roar from the student section welcomed the Mounties to the biggest game of the year. The team responded in kind and ran right into the frenzied arms of the fans in the student section, climbing the wall to embrace each other. Neither team nor fans could get enough of each other. This is the energy, the familial bond, that championships are made from. 11 seconds after the kick off Montclair scored on the kick off return with #1, senior Danny Webb carrying the ball, protected by #9 senior DJ Williams, into the end zone and into the history books. The fans went crazy and the team responded in kind. That’s how the whole game went, from beginning to end. Both feeding off the others’ energy. #10, Sr. QB Terrin Earle focuses on winning Montclairs 26th State Championship, MetLife Stadium Dec 1, 2017. Image Scott Kennedy/The Montclair Dispatch. 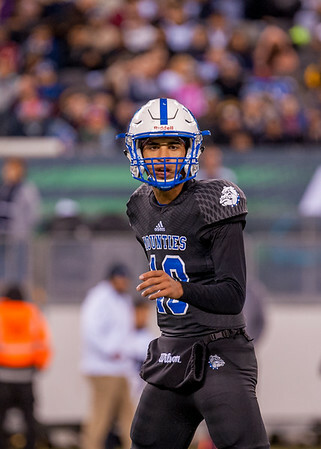 The Mounties were backed up on the field by the marching band, cheerleaders, trainers, security and administrators, all of whom were eager to once again stand witness to yet another State Championship win for Montclair. The NJSIAA is reorganizing how the championships are played out next year. One more level, a regional level game will be played. New Jersey is the only state in the union which does not allow for a single team to claim the title of State Champion. Perhaps the State of New Jersey will consider adding a new tagline to the Metlife Stadium, “Home of the Montclair Mounties”. One Response to "MHS Football and Their Fans Win 2017 State Championship at MetLife"